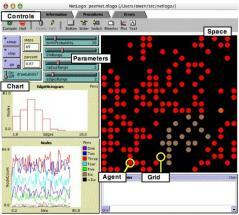 NetLogo is a piece of software based on the Logo programming language which enables you to analyze both simple and complex social and natural phenomena. The tool is capable of simulating a wide variety of natural and social events, targeting dynamic and complex situations and offering the possibility to analyze social behavior. The program’s model library is comprehensive to say the least and contains models from a large number of fields, like math, chemistry, biology, physics, art, Earth science, social sciences and even curricular models from Computer-Based Modeling and The Center for Connected Learning. Any model you use will simulate scenarios that depend on various parameters which you can tweak. Building a new environment lets you work with multiple elements like switches, plots, buttons, input boxes, sliders, choosers, text note areas and more. The source code for the current model is automatically generated by the program in the background and you can use NetLogo to run simulations for numerous types of phenomena.